After Caine2 got nerfed really hard, I am having a look at some alternative casters to match with Haley2. The strongest options right now seem to be Kara, Haley3 and Nemo3. Jarle has already played Haley3 and Kara to death, and no-one in Norway seems to have picked up Nemo3 as a main caster yet, so I really want to take the old man for a spin. Quick analysis of Nemo3 follows. I have not played him yet, so YMMW and take everything here with a grain of salt. Nemo3 has a ranged damage feat. Damage feats are, by and large, very strong feats, and even better when you are not dependent on getting into melee to apply them. The amount of rolls you can get an additional die on are just insane with Nemo. Nemo's spell list seems to be fairly average for a spellslinger. Most of the spells are offensive and many have lightning synergy. There are no debuffs and no movement spells. Chain Lightning is pretty much the same as what his gun does, and what his army does. I do not think it will be used much, I suspect that camping 3 Focus will often be stronger than using this spell. Electrify is a slightly worse Arcane Shield, but then against Arcane Shield is bonkers good. It might even be better than Arcane Shield on a Stormwall, since managing to put in enough push-blocking models while charging it with some heavies could possibly be tricky. Force Hammer is very expensive, but it can be used to set up assassinations. Knocking down a caster, or a couple of hard to hit models like Una's birds and Circle's Warpwolves looks interesting. Since you probably have to boost this will leave you with almost no focus to power jacks or survive the next turn. Lightning Shroud is a +2 STR warjack buff. This is always nice, and extra electroleaps are be even better with Nemo3. Magnetic Field is great against some lists, and useless against others. Nemo does not have any direct control abilities, but he has the potential to hit extremely hard, and he should also have some nice non-linear assassination plays with some possibility of ignoring LOS and terrain as well. He can possibly use his assassination threats to play for scenario, but I think that going for attrition is the way to go. The amount of damage he can leap onto hard-to-hit models is enormous. Using run Firefly 12" + Feat it should be simple to engineer a storm of POW 12 + 3D6 electroleaps around that firefly. Possibly a Stormwall will make this even more reliable by dropping a Lightning Pod next to whatever you want to die. Thorn and Force Hammer has a ridiculous knockdown threat range (22", or even 25" if you arc something through Thorn first). Thorn + Lightning Shroud has a melee threat of 14", with a series of MAT 7 POW 16 attacks afterwards. I made this list especially to support trying out all of Nemo's spells and abilities, and try to get a feel for what works (or not). I imagine that this list will get tweaked quite a lot going forward! Reinhold is there for the double Nemo shot. Spyglass is good occasionally, and the attack reroll helps on Force Hammer assassination runs. Dynamo shoots insanely hard with the Nemo3 feat, and he gets rerolls as well to help him with Chain Reaction. With a Firefly support and spending 3 Focus for damage he kills an ARM 20 heavy at range on average dice. He also hits really hard in melee. Double Firefly for always having the +2 electrical damage buff. Thorn for setting up Force Hammer assassinations and otherwise allowing Nemo3 to use his offensive spells without instantly dying the next turn. And of course Thorn is just great by himself with his auto disruption. Major Katherine Laddermore since I am bringing so many Storm Lances. Gun Mage Captain Adept since RAT is an issue with this list. His Shadow Fire should help with setting up assassination runs and making sure Dynamo hits with every shot. Journeyman Warcaster for protecting the 5 Storm Lances, and possibly transferring Arcane Shield to Nemo and Finch to protect them in the late game. Storm Lances since they are awesome, and with the potential to get additional dice on assault shots and electroleaps they are even more awesome. Other good models in this list could be Ragman, Rhupert, Arlan, Gobber Tinker. 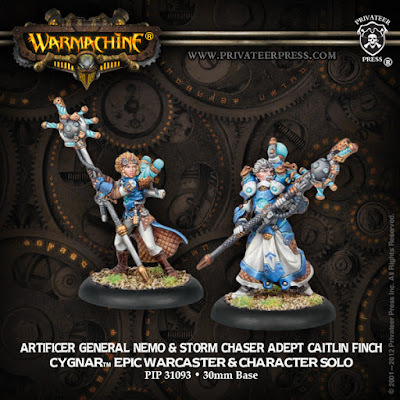 I don't think the Journeyman Warcaster + Firefly package is essential here, so these could be swapped out for more Storm Lances or some other choice solos. You can check out how it plays out in the first game against Haley3!